Slightly upset that his new siblings are trying to hijack HIS blog, Ray decided that he would step it up to get things back on track. …sending positive thoughts to blind dogs all over the world. 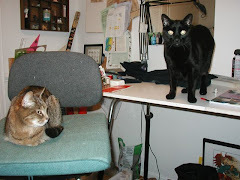 I was winding freshly-spun yarn from a bobbin to a niddy noddy watched closely by Harvey. I knew that I was taking my chances, but he was being a good boy, just reaching out to touch the yarn every once in awhile. Then, faster than I could comprehend, my yarn took off. Harvey was gone, then in a matter of seconds, back again spitting something out of his mouth. I looked at the niddy noddy. The yarn that I had been winding, dangled. I looked at Harvey again. The thing he was spitting out of his mouth was the end of the yarn that matched the one dangling. The fiber was sticking to his tongue and he was shaking his head trying to get it off. Still unable to comprehend what had happened, I looked at the bobbin from which I had been winding. The yarn stretched through the door to the kitchen. I stepped through, my eyes incredulously following the spun fiber. The yarn continued down the hall and into the dining room. I followed it. The yarn raced around the dining room table, back through the hall, and into the living room where the miscreant was picking residual fibers out of his teeth. Gregg, Juno, and Ray came to see what the hysterical laughter was all about. Every time I see this happen, I shake my head in disbelief. I think of what Ray was like when he first came home with me and how he was around Moonie and Hugo and I just can't believe what I'm seeing. I know that Moonie paved the way for Ray's friendship with Juno, but still I'm dumbfounded. I was working in the front yard. Ray was yelling in the back yard. As always, I let him go to it for a bit. After all, dogs must bark even if their 'bark' is more along the lines of a foghorn crossed with a seal. After a few minutes, when I realized that not only was Ray not stopping, he was using his "I FOUND SOMETHING" voice, I put down my rake and went to investigate. I'm telling you, there's something there! OMG, this is SO exciting. Ray was in the back corner of the yard near the shed, his nose pressed through the weathered wooden slats of the fence, his tail wagging. As I watched, he pulled his snout out, raised his head to yell, did a little dance, then stuck his nose back through the fence. As I walked towards him I wondered what had caught Ray's attention. This winter, a kamikaze squirrel moved into our shed. It launches itself at whomever opens the shed door and the noise it has been making inside its living quarters has been driving the hound crazy. But Ray wasn't yelling at the shed, he was yelling through the fence at our behind-us-and-over-one neighbor's shed. I wondered if they had a kamikaze squirrel too. I also noticed a newly-dug mole trail through part of yard and wondered if maybe he had tracked the mole somewhere. "What's up, Ray?" I called to my dog as I got a bit closer. Ray turned, and with his mouth open in a big grin, excitedly pranced to me, then back to the fence looking over his shoulder with a "You gotta see this," glance. I followed the dog to the fence and peered sideways through the board-on-board slats. I saw nothing. Ray, danced back and forth letting loose with deep from the belly yells. "Well, whatever it was is gone," I said to my dog. There! Did you hear that? Tail wagging, panting with excitement, Ray danced and yelled. I turned from the fence, "C'mon, Ray," I said to the excited dog as I walked away. "Ray, come," I said sternly. Ray ignored me some more, yelling and dancing. I turned back to retrieve my dog and drag him away when out of the corner of my eye, through the fence, I saw movement. I stopped. An animal was slinking along the fence towards our neighbor's shed. The color of the animal was similar to most other woodland creatures but the pattern of the ringed tail was unmistakable. Ray, the Redtick Coonhound, had found himself his first raccoon. I was sitting in Gregg's chair, reading the newspaper. The cats were tearing around after each other. Ray was standing morosely in front of me. He wanted my spot. I sighed. Since I hadn't made my breakfast yet, I knew Ray would eventually get my chair anyway so I stood and went to the kitchen. Just like Lucky Charms, the two cats magically appeared. Harvey is a winder. If he thinks food is involved, he winds between any legs available, purring and making tiny cat sounds. It makes food preparation a treacherous business. Juno is a lounger, she picks an inconvenient spot, usually in front of the refrigerator, but sometimes in front of the sink or stove, and splays out, waiting for food to drop. I prepared my toast and cup of cranberry juice and gingerly headed to the couch, Harvey still winding my ankles. Juno followed. I placed my juice on the end table, sat, and reached for the newspaper. Harvey jumped up on the arm of the couch and stuck his head in my glass of juice. "Hey!" I exclaimed, knocking his head out of my glass, "That's MINE." Willing to yield the juice which he didn't want anyway, Harvey turned to my plate of toast. I saw where he was looking and raised my plate high but not quite high enough. Harvey stood on his back legs and hooked one paw over the edge of the plate trying to drag it down. I pulled the plate away and the cat, who was still balanced on the arm of the couch, fell to the floor. Satisfied that my food was now safe, I started eating and turned back to the newspaper. paper, leapt into the middle of it and tore into the article I was reading. Harvey joined her; a wrestling match ensued. "Hey!" I yelled, "I was reading that!" Listening to all the commotion and no longer able to contain himself, Ray sprung from his chair to help me get the pesky cats under control. Juno watched him race by then continued her assault on the newspaper. Harvey squirmed himself under the couch, then as the Ray circled back, stuck his head out to watch. I could tell he was considering a whack at the dog from the safety of his hiding place. I left the restive animals and went to put my now empty dishes in the kitchen. When I returned, Ray was just curling back into a ball on Gregg's chair. Juno had abandoned the paper and was on the chair on the coffee table quietly grooming herself. I smiled at the serene scene and walked to my spot on the couch. There was a sharp pain in my toe. I screeched. Ray jumped from his chair to help. Harvey disconnected his claws from my sock and raced out from under the couch. Juno jumped from her perch and took off after him. Ray took off after the two of them. I sat back down on my spot and picked up the shredded newspaper. I was brushing my teeth. There was a flash of black and white. It was Harvey at full speed. Hearing the running water and wanting to play with the stream, he ran into the bathroom, jumped up on the toilet seat (which was open), dexterously avoided falling in, and still at full speed, leapt for the sink. Being a bit off-balance as a result of having to avoid falling into the toilet, Harvey missed his target with all four feet but caught it with two. Unfortunately, one of these landed, not on the solid surface of the sink but on the tube of open toothpaste. The toothpaste, as it is wont to do, splorted out and the tube fell to the floor. Harvey dangled a second by his two front feet struggling to get a grip on the un-grippable surface then fell into the trash can next to the sink. The trash can fell to its side. Harvey shot from the room. I cleaned my mirror. The hype surrounding it made it seem like a disaster of biblical proportions was imminent. School was canceled and the local and federal governments were closed. In the end, we only got about five inches of the white fluffy stuff. But, in defense of the disaster predictors, it was five inches of snow underlaid by a sheet of ice. On the bright side we were all able to sleep in until seven. When we finally did get up, Ray decided to play with Juno and she decided that it was fun. Ray tracked her around the red chair in the family room. Juno kept out of his reach. When the dog got too close, Juno ran around the chair so that she was just behind the dog. As the blind hound continued on around the chair futilely trying to find the little pudge, she gleefully watched him. To make the game more interesting, with each turn, Juno let Ray get a bit closer to her. Hating to be a party-pooper but seeing Ray get more and more excited as he got closer and closer to his playmate, I felt it wise to stop the game before somebody got hurt. Yes, please, I'd like to go in now. By mid-morning, during the thick of the snowfall, Gregg and I started shoveling. Since not a single car had left the cul-de-sac and not a person was out and about, I decided to let Ray out to wander along the street. I bundled him up in his sniffing sweater and a neck warmer and turned him loose. Ray went to pee on a few things when the velcro fastenings on his sweater, impeded by large quantities of dog hair embedded in the hooks, gave way. The sweater slipped down around his waist. I went to remove Ray's skirt and he scampered off, loving his freedom. It's not often Ray is let loose to roam, but given the conditions, I figured Ray would not be tempted to go far. I was right. After about ten minutes, he'd had enough and was ready for warmth. Returned to the boring security of his house, Ray was ready to play again, this time with his treat-ball. It is Ray's favorite toy next to rawhide bones (nothing tops a rawhide). Ray lets me know when he wants me to fill his treat-ball by standing next to it and staring in my general direction. If I don't get the hint, Ray comes to stand near me, just out of arms reach, and stares. No matter how much encouragement he gets to come closer for a pet, Ray doesn't budge. He just stares. I know that he is using the dog equivalent of the Vulcan mind meld and it seems to be a fairly efficient method of communication. I get the point and fill his ball. Ray has gotten a lot smarter at playing with his treat-ball since the first time. Now, instead of rolling it all over the house and getting it stuck everywhere, he rolls it in somewhat of a circle so that it doesn't go too far. He has also gotten a lot better at finding the treats that it dispenses; rarely do we find a stray treat lying on the carpet. After his treat-ball exercise, Ray was allowed to visit his across-the-street neighbors, Sandra and Maddie. Sandra, who had come for some knitting help, took the blind hound home with her so that he could say hi to his Spaniel friend and the other occupants of the house. In keeping with the new snow-day tradition of being off-leash, Ray happily led the way, trotting down our driveway and across the street then racing up the opposite driveway to the front door. Sandra's house has recently become more interesting to Ray because of its recent acquisition of a house guest. Chip, a friend of Sandra's son, meets the hound's unspecified but stringent qualifications for favorite status and receives Ray's scary wrist-grab-greeting. Chip doesn't get quite the same star treatment as Ray's friend, Caleb but it is obvious that Chip is one of Ray's chosen ones. Chip and Caleb have the commonalities of being about the same age, being male, and having their names start with the letter 'C'. (Sandra's daughter, Kappy, is also a chosen one - I can't explain the anomaly) Other than that, it's hard to know what specifications Ray uses to choose his special friends. Can't a cat get some sleep around here? I think his leg is looking better, don't you? Don't worry, Ray, it'll be ok.
You're taking my picture, aren't you? Ummmm, Juno, you're in my way. I'm telling you it wasn't me, it was Harvey!